YO! Sushi has transformed the concept of Japanese food and created a revolutionary dining experience with conveyor belts filled with a rainbow of coloured plates. They have made sushi fun, cool and accessible to everyone. 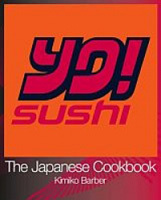 This cookbook brings YO! Sushi’s delicious dishes to the home and shows just how easy it is to make your own sushi and other Japanese fare.